This site on Beacon Avenue is being remodeled into The Oak. Photo by Wendi Dunlap. 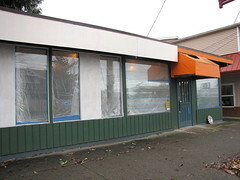 The much-talked-about Oak restaurant, expected to open on Beacon Avenue this spring, has a problem. Owners Lisa Jack and Mat Brooke have received a letter from the state Liquor Control Board which states that they face possible denial of their liquor license because the Board has received 14 protest letters but only 5 letters of support for the business. They must respond by March 26 with a statement outlining why the Oak should still be approved for a liquor license, and letters from the community will be considered as well. Brooke and Jack attended the North Beacon Hill Council meeting last week and spoke about the project. They have taken steps to reduce neighborhood concerns, including locating the 21+ bar portion in the center of the building, to limit exterior noise; no door access to the alley, except for emergency exits; no smoking allowed in the back of the building; and no karaoke or live music. There will be all-ages kid-friendly dining space. The menu is planned to be “family-friendly” comfort food such as burgers,salads, macaroni and cheese, and sweet potato fries, with lunch and dinner seven days a week until 10 p.m. as well as weekend brunch. Ingredients will be locally-sourced. Brooke and Jack will not be absentee owners; at the meeting, they explained that they will be living at the site themselves, and have a direct stake in the quality of the neighborhood. After the NBHC discussion, several neighbors who live or work adjacent to the Oak site and had attended the meeting to express their concerns about a possible “tavern” moving in indicated that their concerns had been addressed and they seemed to have a much more positive feeling about the new restaurant. It is unclear whether the protest letters the Liquor Board has received were sent before the NBHC meeting. When the news came out on the Beacon Hill mailing list last night about the Oak’s difficulty with the Board, the reaction on the list was one of surprise, with several subscribers expressing their intent to write in support of the business. In the previous discussion on the Beacon Hill Blog, the comments were overwhelmingly in favor of the Oak. According to the State Liquor Control Board, La Esperanza de Seattle at 2505 Beacon Ave. S. has made a new application for a liquor license of the type Grocery Store – Beer/Wine. This appears to be the same as a license application we wrote about last May; it is not uncommon for notifications to be re-announced with a new date if certain changes had to be made to the application. The applicants are La Esperanza de Seattle GP, Geovanni Santacruz, and Omar Santacruz. The license number is 407963. If you wish to make any comments on this application, whether positive or negative, e-mail customerservice@liq.wa.gov.